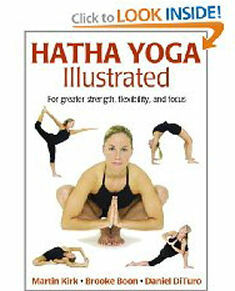 Hatha yoga poses, or asanas, are the foundation for every physical yoga practice. Some asanas may feel awkard for beginners, but over time the postures will become more fluid, and your body will change. You will begin to notice nuances in each asana, and those will change every time you practice. As you gain a better understanding of your personal goals and your body's response to a dedicated yoga practice, you'll be able to modify postures to suit your needs. The Warrior II pose, virabhadrasana II, shown here, is a strong asana that will build stamina, focus and flexibility. Garudasana, or Eagle pose, works to build focus, strength and balance. It is a great shoulder and upper back opener and also targets the hips and lower back. Wrap the left leg on top of the other leg, bending the right knee, and wrap the left arm under the right. Aim to line up the elbows and the knees with the navel, and begin to sink deeper into the hips, keeping your spine straight and your gaze soft. Switch sides with the right leg on top and the right arm under the left. It can be tricky to maintain balance in this pose, and if you fall out, just get right back in. Balance can be helped by fixing your gaze on a single point ahead of you, on the wall or floor, that does not move. Uttanasana, or Standing Forward Bend, is a great pose to help loosen the back side of the body. If you have tight hamstrings, it's OK to keep the knees bent, and to protect the lower back try to glue the bottom ribs to the thighs, bringing your hands to the floor for support. Deepen your breath in this pose and allow the breath to help release tight muscles in your neck, back and legs. If you feel strain in the lower back, keep the knees bent enough so you can rest the ribs on the thighs and the hands on the floor. As you deepen in the pose, continue to press the ribs into the thighs and lift the tailbone with each exhale. Paschimottanasana, Seated Forward Bend, resembles a stretch many athletes and dancers do all the time. What makes this pose tricky is the effort of maintaining length in the spine while rooting through your hips. First, create length in the spine by lifting the torso out of the sits bones, and on an exhale, hinge from the hips, reaching the chest toward the toes until you feel your body naturally stopping. Allow your hands to fall to your legs. To deepen, continue to lengthen the spine, reaching the chest toward the toes on each inhale and pull the sits bones to the back wall on the exhale. Paschimottanasana is a great lower back and hamstring stretch. A strap placed around the balls of the feet, held onto with each hand can help maintain correct posture. Also, elevating the hips on a block, rolled up mat, blanket or bolster can provide a deeper stretch to those with tight hips. Plank posture strengthens the entire core. Correct alignment in this pose starts from placing the hands directly under the shoulders and maintaining a straight line from the shoulders to the heels, with the hips lower than the shoulders. The back should not dip toward the ground. The thighs should be strong, the shoulders rolled down the back, and the heels pushing to the back wall. Chaturanga dandasana is a challenging pose and requires a lot of strength in the core and arms. Beginners should start with chaturanga on their knees to achieve correct alignment and gradually work up to the full expression of the pose. Always keep the chest reaching forward, the shoulder blades moving down the back, the elbows grazing the ribs, and the palms right under the shoulders. In chaturanga dandasana, unless practicing with knees down, the entire body except the toes and the palms are lifted and hover several inches above the floor. This pose is typically a part of the Sun Salutation series used in many yoga methods. A great heart opener, Urdvha Mukha Svanasana, or Upward Facing Dog, requires a lot of arm and core strength to stay in proper form. With the tops of the feet and the palms of the hands the only body parts touching the floor, the chest is pushing forward, the shoulders are rolling down the back and the gaze is lifted toward the sky. Trying to keep the chest open and the shoulders down and back, away from the ears, requires focus, but it will help you avoid dumping pressure into the lower back, which can cause pain or injury. There are many variations of bhujangasana (Cobra pose), but all aim to strengthen the back while opening the front of the body. Starting lying face down, bring the palms just under the shoulders. Take an inhale and begin to peel the head, neck, shoulders and chest from the ground. Simultaneously, push the tops of the feet into the ground and feel the back body turn on. To deepen this pose, lightly push into the hands, using a bit of arm strength to lift the chest higher. Keep the thighs on the ground and continue to push down through the feet. Pull the shoulder blades together and down the back and stretch the chest forward. Probably one of the most recognizable asanas is Downward Facing Dog. Used as both a transition pose and a resting pose, it is great for building strength in the arms, shoulders and back, while working to lengthen the whole back side of the body. Starting with feet hip-distance apart, lift the hips up and back while reaching the heels toward the ground (they don't have to touch). Hands are shoulder-width apart and fingers are spread wide, pushing evenly into the ground. Spread the shoulders apart and send the shoulder blades down the back. To deepen this pose, bend the knees and push the hips up and back even more while pressing firmly with the hands into the ground, as if you're trying to push the ground away. Feel space open up in the spine, then work to sink your heels back toward the ground maintaining the height of the hips and the length in the back. One of the best hip-opening asanas that is accessible to most yogis is Kapotanasana, Pigeon pose. There are many variations of this pose, the most common being half pigeon, shown here. Bringing one leg in front so the shin is parallel to the top edge of the mat, draw the other leg behind so the knee is on the ground. The back foot can be flat on the ground, or the toes can be tucked under. The main point of alignment here is to get the hips even, and not lean onto one side or the other. You should feel this in the outer hip and the piriformis muscle of the front leg, as well as in the psoas of the back leg. With tight hips, using a prop, such as a blanket, folded towel, a bolster or a block to place between the stretched hip and the floor will provide additional comfort and support in the pose. Dharunasana, or Bow pose, works the entire front of your body, right down to your toes. It can be an intense back bend, so entering the posture with good awareness and alignment is critical. From a face-down position, bend both legs in and reach to grab the ankles or the feet. On an inhale, begin to kick the feet into the hands and extend the legs. Pushing the legs and pulling with the arms will allow the chest to rise. Squeeze the knees toward each other, and keep the gaze forward. Pull the navel in toward the spine. The thighs may or may not lift from the ground, but you will feel a great opening in the shoulders and chest. Setu Bandha Sarvangasana (Bridge Pose) strengthens the quadriceps and the glutes, while opening the psoas and the chest. It can be an intense back bend, or with blocks and bolsters it can be used as a restorative pose. Placing a small yoga or Pilates ball or a yoga block between the knees will help keep the knees in good alignment as you lift the hips. To deepen the pose, continue to roll through the spine into the middle back, lifting the chest toward the sky and pushing into the feet. Urdvha Dharunasana, also known as Wheel pose or upward facing bow, may be a throwback to a carefree childhood, when popping up into this backbend was like skipping down the block. Don't be fooled; this is a very intense backbend, and much attention should be paid to correct alignment of the feet and arms. Practicing with a block placed between the knees and a strap cinched around the forearms will help let you know where your limbs should be, as they have a tendency to widen on their own. The chest should push forward as you continually push into the feet, which should remain in alignment with the knees. Ustrasana (Camel pose) is another intense backbend that has a knack for bringing up deep-seated emotions. To stay in good alignment, make sure to continually lift the chest toward the ceiling and push the hips forward, avoiding collapsing into the hands or shoulders. Variations of camel include tucking the toes under the bring the heels a little closer to the hands, placing the hands on the lower back, squeezing the elbows toward each other and shifting the body back just to a point that feels comfortable. Balasana, or Child's pose, is a wonderful, calming posture that is used for rest and for transitions. With bent knees either touching or spread apart, draw the hips back toward the heels and bring the forehead to the mat. If the forehead does not comfortably reach the ground, use a block, blanket or bolster to rest the head. The arms can rest comfortably alongside the body, with the palms face up, or they can reach out in front. You might even want to stack your hands in front of you and rest your forehead on the hands. Breathing should be slow and full in child's pose, and it should feel restful. If there is any discomfort, adjust the pose and use props to find a place of rest. Finding calm, clearing the mind and being present in the body is what yoga is all about. Sukhasana, or Easy Seated pose, looks easier than it may feel. The legs are bent and ankles crossed, the hips are even, and the spine is long. Shoulders are down, neck is long, face is soft. The hands can rest on the knees or in the lap. Eyes can be closed. Those with tight hips can use a blanket, bolster or block to elevate the hips, making this pose more attainable and comfortable. Concentrate on keeping the spine erect and the crown of the head lifted. Baddha Konasana, also known as Bound Angle, Cobbler's or Butterfly pose, is a way to open the groin and inner thigh, while working on maintaining good posture. Those with tight hips might choose a block, blanket, pillow or bolster to elevate the hips, making this pose more accessible and comfortable. The soles of the feet are touching, and the knees are bent and open to the sides. The hips are even, and the spine is long, shoulders relaxed. The hands can rest on the knees, they can grab the ankles or the feet. Deepen the pose by extending the spine and hinging the hips to bend forward toward the feet. Tadasana, or Mountain Pose, is one of the foundational postures of all hatha yoga. It is a grounding and simultaneously uplifting posture that can inform every standing and many seated postures. Rooting through the feet and strengthening the legs, draw energy up the spine until the crown of the head is lifted. Draw the shoulders down and back, away from the ears and pull the ears back to align with the shoulders. Draw the navel in and up, tucking the lower ribs under. The arms can be bent in namaste, as pictured, or they can be alongside the body, fingers toward the ground and palms facing forward. This is a strong pose that produces a lot of body awareness. It can be used to center the mind. Vrksasana, or Tree Pose, is a popular pose that can help improve balance. There are many variations of this pose, but they all require standing on one leg and working on lengthening the spine. The foot of the bent leg can come to the ankle, shin or inner thigh, anywhere but the knee. The arms can rise above the head, hands together or apart, or they can stay together at heart center. If balance is a struggle, keeping one hand on a wall or a chair for support can be a good option. Sirsasana, or Headstand, is an impressive pose that, with attention to proper alignment, is not as difficult as it looks. Practicing against a wall is the best way to learn this pose. Many yogis follow the rule of having 90 percent of the body weight in the shoulders and 10 percent on the crown of the head touching the ground. The feet should extend upward as if they were standing on the sky, the belly should remain strong, and the shoulders should be broad and away from the ears. It is said that inversions, such as headstand, should be held for at least a minute to receive the full benefit. Navasana, or Boat pose, strengthens the abdominal muscles and psoas. There are many variations of this pose, making it accessible for beginners. Starting with the feet on the ground and the knees bent, begin to lean back with the chest lifted. The arms stretch forward, and if possible, the feet can rise off the ground. For more of a challenge, work to straighten the legs. The key here is to remain balanced on the sits bones and not rock back onto the tailbone or bend the back. The gesture of Namaste is not as much a pose as it is a benediction. The basic translation is: "I honor the light that shines within you that also shines within me," although there are many variations of that translation. In Namaste, you'll bring the hands together at the heart center, palms touching. There are many more yoga poses to learn. Whether a beginner or an experienced yogi, yoga practice helps calm the mind while strengthening the body.